Registration fee of Rs. 400/- through Debit/Credit card OR Rs. 435/- through any AP/TS ONLINE FRANCHISE CENTRES located across AP and Telangana on or before 15-05-2018. 1.The candidate should be an Indian citizen. 2. Candidates should have passed with at least 50% of marks either B.A./B.Sc./B.Com./B.C.A./B.Sc. (Home Science)/BBM and/or the Masters Degree in Science/Social Sciences/Humanities (relevant subject of Pedagogy) at the time of submitting the application for B.Ed. Entrance Test. Candidates should have secured a minimum of 55% marks in B.E/B.Tech. with Science/Mathematics as one of the subjects or any other qualification equivalent thereto, are eligible for admission into the B.Ed. ODL programme. However the candidates belonging to SC/ST/BC/PWD should have secured a minimum of 40% marks in the qualifying examination. 3. Candidates who are appearing for final year examination in the Qualifying Examination (Bachelor or a Master Degree) can also apply. 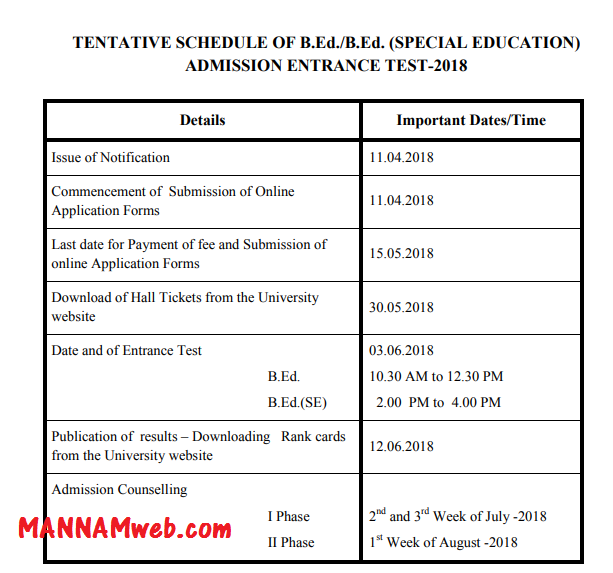 But they are required to submit the Marks Memo and Pass Certificate (Provisional Certificate) of qualifying examination at the time of Admission Counselling. Otherwise they are not allowed for admission. 4. Apart from the above the candidates must fulfil any one of the following conditions as per NCTE-2014 Regulations. i. Should be Trained in-service Teachers in Elementary Education (NCTE recognised Teacher training completed in-service Teachers in Elementary Education i.e. working in Govt/Aided/Local Body/Govt. Recognised Schools). ii. Should have completed NCTE recognised Teacher Education programme in Elementary Education through face-to-face mode (TTC/D.Ed./D.El.Ed./B.El.Ed./ TPT/HPT/UPT/B.P.Ed./ D.P.Ed.-Qualification is must). 5. The reservation for SC/ST/BC/PWD categories shall be as per the rules in vogue. 6. Candidate should have completed 21 years as on 1st July 2018. There shall be no upper age limit. i. As per the GOMS No: 92 and GOMS NO.13, the candidates who passed MBBS/BDS/BPT/BAMS/BL/LLB/B.Pharm./BHMT/BVSC/B.Sc.(AG)/BOL/B.A. (Languages) etc. and any such Professional and Job Oriented courses are not eligible for admission into B.Ed. Programme. ii. Diploma in Early Childhood Education (DECE) /Diploma in Preschool Education (DPSE), Diploma in Arts Education (Visual Arts)/(Performing Arts) and other Pre- Primary Teacher Training Certificate/Diploma (PPTTC) completed candidates are not eligible for admission into B.Ed. (ODL) Programme. Admissions are made strictly on the basis of merit in the Entrance Test. Only those candidates who satisfy the eligibility criteria fixed by the University will be admitted. Centralized admissions will be done on the basis of the score obtained in the Entrance Test conducted by BRAOU. The candidate will be required to submit only the filled-in application form without any enclosures. The enclosures (documents) mentioned in the instructions for filling-in the application form to be submitted later after receiving the letter of offer for admission counselling to B.Ed. from the University after the entrance test. The entrance test will be held on 03-06-2018 from 10.30 AM to 12.30 PM at Regional Co-ordination Centres of the University. Candidates are required to be present in the examination hall by 10.00 AM. The question paper, except General English section, will be in Telugu. The University reserves the right to allot candidates to any other Entrance Test. Centre(s) in unavoidable circumstances. The Entrance Test Question Paper will have 2 parts for 100 Marks with 100 Objective type (Multiple Choice) questions. Part-I: General English Comprehension (25 Marks) Reading Comprehension. Correction of Sentences, Articles, Prepositions, Tenses, Spelling. Vocabulary, Synonyms, Antonyms. Transformation of Sentences-Simple, Compound and Complex; Voices; Direct Speech and Indirect Speech. Note: The Qualifying mark in the B.Ed. Entrance Test for all candidates, except SC/ST, is 35. For the candidates belonging to SC/ST communities ranking will be extended below the qualifying mark. The candidate has to register his/her candidature for appearing B.Ed./ B.Ed. (SE) Entrance Test on University website www.braouonline.in only and payment of registration fee done through Debit/Credit Card OR any AP/TS ONLINE FRANCHISE CENTRE across AP and Telangana on or before 15-05-2018. Go through the following instructions given below and register accordingly. 2) Degree/PG Marks Memos and Provisional /Convocation certificate. 3) NCTE recognised Elementary Teacher Education Programme completion Certificate. 5) Latest Passport size Photo with Signature (JPEG format and less than 60 KB). Candidates will be ranked in the order of the merit in the B.Ed. entrance test. In case of candidates getting equal mark, Part-C marks will be taken into account to decide relative ranking. In case of tie the marks obtained in Part-B and then Part-A will be taken into account to decide relative ranking. In the case of candidates getting equal marks in each of the parts of the test paper, age shall be taken into consideration for relative ranking among the bracketed candidates, and the older candidates shall be given priority. The rank obtained in B.Ed. Entrance Test is valid for entry into B.Ed. Programme for the Academic Year 2018-2019 only.